They say that street food is an up-close look into the soul of a city, with hot dog push carts, corner pizza stands and Italian sausage vendors saying more about the real New York City than the chic pan-Asian eateries with the paparazzi outside. In South Austin, a slew of mobile food vendors provides a takeout window to the soul of a once-funky, Hispanic-flavored neighborhood that’s going high-end fast. Lunchwagons aren’t just for tacos and sno-cones anymore, as South Lamar Boulevard is fast becoming Gourmet Street Food Row. On that winding boulevard of rising lofts and daredevil j aywalkers you can get Vietnamese sandwiches and vermicelli bowls at Lulu B’s, linguine scampi and thin-crust margherita pizza at Giovanni’s and authentic Chicago hot dogs and dipped Italian beef sandwiches at Chris’ Little Chicago – all without going through a door. 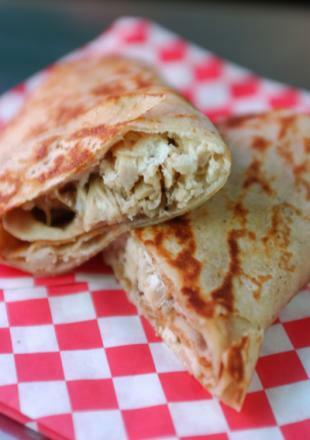 Just a block off South Lamar Boulevard, tucked away on Jessie Street, sits the 1966 Avion trailer that’s home to Flip Happy, which started the upscale meals-on-wheels craze two years ago with its crepes. And three blocks west on Barton Springs Road is the Little Sub Trailer, with hearty soups and customized sandwiches that are a slice above ThunderCloud. Even the taco, the traditional titan of truck fare, is getting the epicurean treatment over at Torchy’s (1207 S. First St. 366-0537), where you can get sliced Jamaican jerk chicken with grilled jalapeños, mango, sour cream and cilantro on a flour tortilla for $3.50. dreams of opening a storefront to fill a void for the Vietnamese sandwiches (banh mi thit) they loved back in Southern California. They were equipped with amazing recipes from their mother, Thao, a native of Vietnam, not to mention determination and a solid business plan. But it takes a lot of financing, in addition to those qualities, to own a restaurant on South Lamar. “It would’ve cost us at least $200,000 to open a restaurant, and without any experience (in food service), there’s no way we could’ve gotten a loan,” says Bayer. There were also those tedious hoops of a full plan review by city inspectors (building codes, parking availability, accessibility ramps, etc.) that the sisters would have had to jump through before opening a standard eatery. Mobile kitchens are not required to have parking or even a bathroom. The Austin/Travis County Health Department regulations for mobile vending units state that lunchwagons not be permanently connected to water or power supplies – they have to be completely mobile – so there’s a water holding tank, a wastewater tank, an electric generator and propane for the burners. It can also get hot and crowded inside. Still, the number of mobile vending permits in Austin has risen to 781 as of June 2008, up from 632 just three years ago. When interviewed for this article, owners of the four lunchwagons that opened this year or in 2007 all cited high real estate leasing rates as a reason they went for a mobile permit. With a storefront out of their budget, Bayer and Gustavson had a customized 8-foot-by-18-foot lunch truck built for them by Concession Nation of Florida and found an empty lot to rent next to a tire shop. Lulu B’s estimated start-up cost was $50,000 to $70,000. 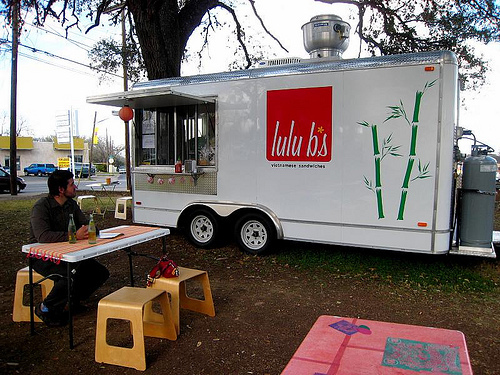 As with most lunchwagons, the lease is month to month, but if Lulu B’s loses its spot, the owners can just pull their kitchen to a new one. Spaces for mobile kitchens generally rent for $500 to $1,000 a month, depending on the size and location. Lulu B’s business was slow at first. It always is with mobile kitchens, where the clientele is usually built by word of mouth or newspaper reviews. Lulu B’s got a rave in the local weekly in March, and business has been slamming ever since. Soon after former legal secretary Jeannie Gigliotti, one of those amateur cooks whose friends constantly tell them they should turn pro, opened her soup and sandwich trailer (then called Deli Fresh) last fall, she wondered what she’d gotten herself into. One day she took in exactly $14.53 in six hours. But slowly the clientele grew, with old customers bringing new ones and nearby office workers calling in lunch orders for the whole gang. “There was one day I was working by myself and out of the blue, the orders were coming nonstop,” says Gigliotta, married to local sound man John Gigliotta. When the pepper settled, she counted up the day’s take – more than $400. Lunchwagons are popular because the low overhead is reflected in lower prices than in sit-down restaurants. But customers return, often with friends, only if the quality of food is comparable. Discovery, and turning others onto it, is a big part of lunchwagon allure. Julio Rangel’s cooking is what brings Vinnie Ambrosone back to Giovanni’s Pizza Stand at least once a week since he discovered the red truck set back in the parking lot of a Mobil gas station four months ago. 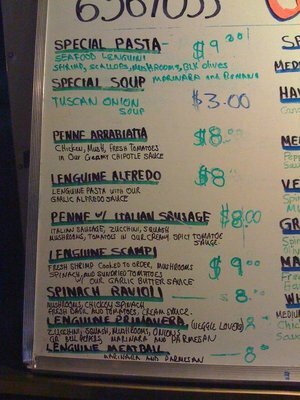 “For $8 here you get a plate of penne arrabiata that, I guarantee you, is as good as the one you’d pay $24 for at a fancy Italian place,” Ambrosone says. It’s working. The food at Giovanni’s rivals the top Italian eateries, but at Vespaio or La Traviata you won’t be hassled by a street person trying to sell you an unopened bottle of scotch for half the sticker price, which happened to Ambrosone. Real food. Real world. That’s what you get when your food is handed to you out of a window and you’re not in your car. Cooped up in a bland office all day, some folks like to get out there in humanity for a while, which is why in lunchwagon lines you’ll find insurance salesmen next to construction workers next to dreadlocked hippies next to slumming Tarrytown housewives. Flip Happy- the crepes that ate Bobby Flay. Unlike the old lunch trucks, which show up where the hungry people are (construction sites, music festivals, Sixth and Red River streets), the new mobile grubberies are destinations unto themselves. Get used to the upscale lunchwagons of South Austin; they aren’t going anywhere. This entry was posted on December 11, 2011 at 3:59 pm	and is filed under Uncategorized. You can follow any responses to this entry through the RSS 2.0 feed. You can leave a response, or trackback from your own site.